15 Minute Baked Salmon with Parmesan Crust, super healthy and full of flavor. 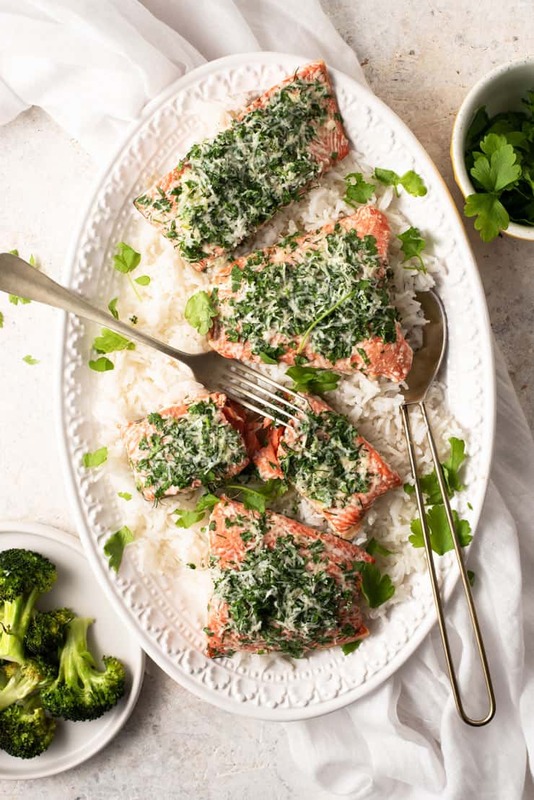 This salmon is made with delicious fresh herbs, garlic, freshly grated parmesan and is perfect for a healthy dinner on busy weeknights! I often tell clients to boost their intake of omega-3’s from wild caught fatty fish. For some reason, most of us – myself included – aren’t as consistent as we should be with getting fish onto our weekly menus. I’m not sure why that is. 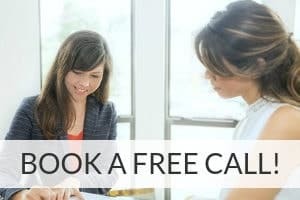 Fish has a reputation for being pricey but rotating between more expensive varieties like salmon and more affordable ones like wild Alaskan cod actually makes fish pretty comparable to the price of the farm raised meats and poultry we buy. And most fish recipes cook pretty quickly – this 15 minute salmon with Parmesan crust is a prime example of that! We all love 30 minute meals, right? Well this salmon has that beat by half! And here’s another little time-saving tip to shave a few minutes off your prep time. Have the staff at the fish counter debone the salmon and cut it into individual portions so you don’t have to do it later! If you chose your side dishes right – like a pot of rice and a quick cooking vegetable like steamed broccoli, wilted spinach, or my easy roasted broccoli and cauliflower, and you can still get the entire meal on the table in half an hour! 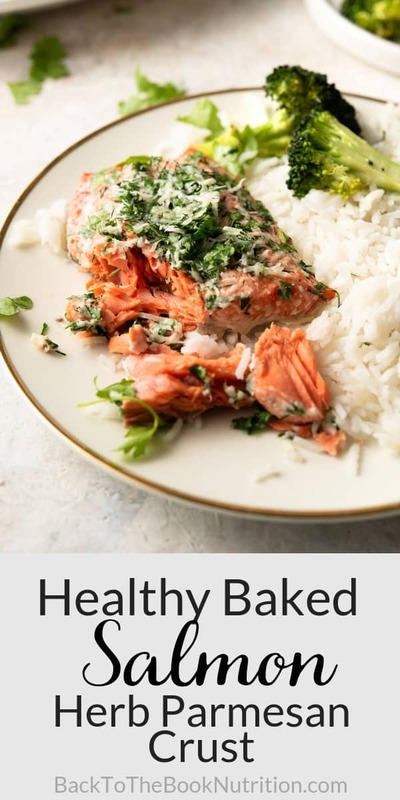 This salmon is so simple and is loaded with healthy omega-3 fatty acids. Omega-3’s are highly anti-inflammatory and have been shown to be beneficial in a host of chronic conditions like heart disease, diabetes, cancer, mood disorders, and more. Unfortunately, most of us get far to few omega-3’s of them as compared to omega-6’s. Read more about omega-6 to omega-3 balance and inflammation here. 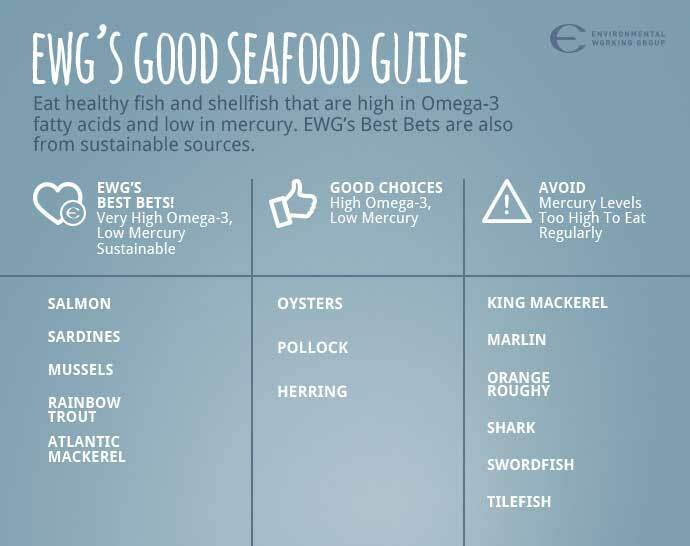 Fish and seafood sometimes get a bad rap for mercury and other contaminants, but wild salmon actually tops the Environmental Working Group’s list of the best sources of omega-3’s with the lowest mercury content. It’s super easy to adapt this salmon with Parmesan crust with different simple flavors. If you’d like a little extra texture and crunch you can add in some panko crumbs. You can also brush the salmon with mustard both wholegrain and Dijon would work great. Try a mix of different fresh or dried herbs and even a sprinkling of red pepper flakes for heat. 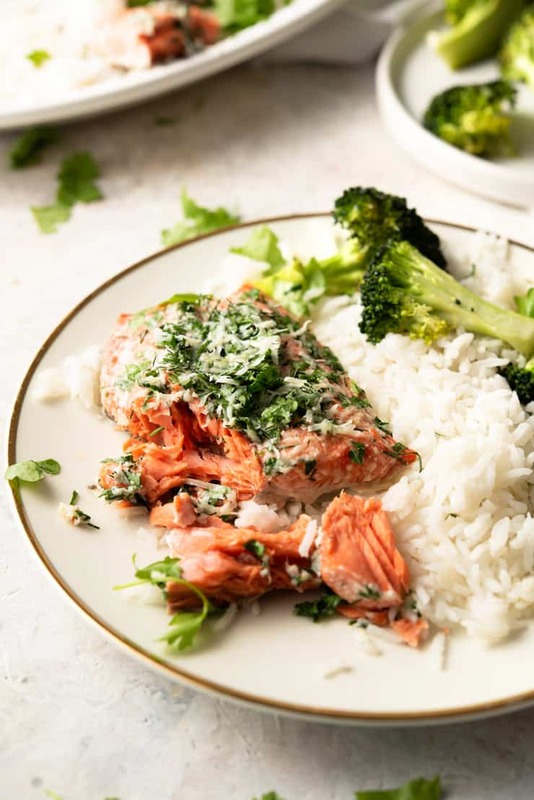 Choose easy to prep and quick cook sides to make this meal super quick and healthy, rice and broccoli are my favorite go tos. You can experiment with different herbs to change it up. Make sure to freshly grate the Parmesan yourself as pre-grated doesn’t have the best flavor. Bring the salmon out of the fridge 10-15 minutes before cooking. Like meats, if it’s cooked from cold it’ll tighten and toughen up. Use wild-caught salmon when possible. Make sure to not overcook the salmon or it will dry out, 10-12 minutes is all it needs. If you’re unsure if it’s done you can use a meat thermometer it should reach between 135-140F. Leftover salmon can be stored in the fridge and eaten cold in salads, flaked into omelets or can be reheated in the oven until hot all the way through. Use butter or avocado oil spray to grease 2 casserole dishes. Divide salmon pieces evenly between the two dishes, skin side down. Sprinkle liberally with sea salt and Bake for 10-12 minutes or until internal temperature 145 degrees. While salmon is baking, prepare the topping: mix the Parmesan, garlic, and herbs in a small bowl. 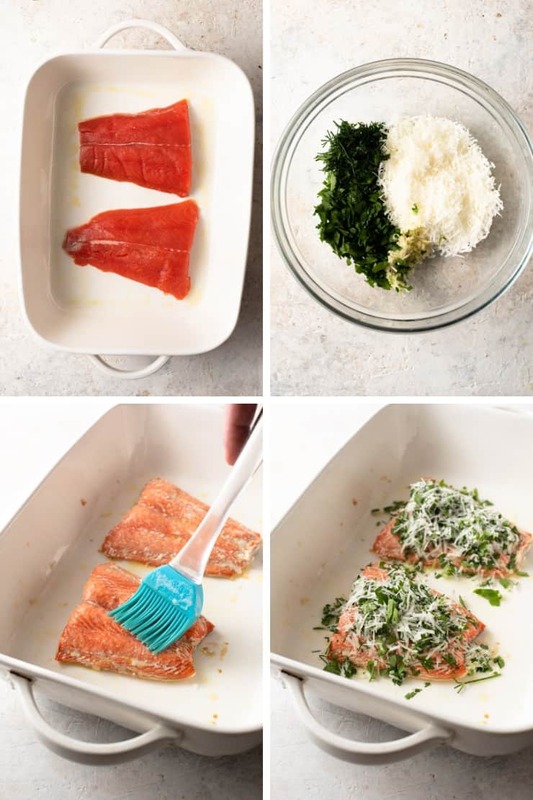 Remove salmon from oven, brush with half of the melted butter, sprinkle a thick layer of Parmesan herb blend on top of each piece, then drizzle the remaining butter evenly over all. If desired, return to the oven for another 1-2 minutes, or until Parmesan just begins to melt. Make sure to freshly grate the parmesan yourself as pre-grated doesn't have the best flavor. Bring the salmon out of the fridge 10-15 minutes before cooking. Like meats, if it's cooked from cold it'll tighten and toughen up. Make sure to not overcook the salmon or it will dry out, 10-12 minutes is all it needs. If you're unsure if it's done you can use a meat thermometer it should reach between 135-140F. I agree Dena – having the stuff of the fish counter debone your fish and prepare it for cooking is an incredible time-saver, unless you enjoy doing that yourself! Great tips and recipe! Thanks for the healthy tip Dena my Doctor told me to eat salmon, sardines or mackerel. Of the three mackerel is my favorite so I get that from the fish market up the road from us. Although I need to do that more often. 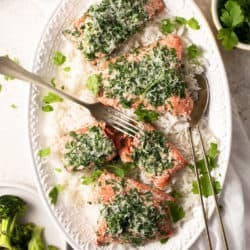 Your Salmon parmesan herbs is quite simple to make; can’t beat a simple, flavorful, healthy meal. Love that this salmon recipe is fast but full of flavor. Great recipe for the everyone! I really could eat salmon almost every day. Thanks post this quick recipe. I love the parmesan topping on the salmon for added flavors. I always look a quick salmon recipe for those busy weekday nights. That herb mixtur sounds delicious. Can’t wait to try next week! What a great combo! Salmon is one of my favorite dishes and such a good option when looking for lighter better for you proteins. And then ready in 15 minutes? This is awesome buying some salmon this weekend to try your recipe. That salmon is cooked PERFECTLY! Love all those herbs too. I’m going to try this with the parmesan too this time… never made it like that before. The Parm really adds some great flavor and texture – I hope you enjoy it! Oh yum! I love everything salmon, or any fish; and this dish truly takes me to paradise. And I love how you combine parmesan with herbs to it. Simple ingredients and yet brings out so much flavors. 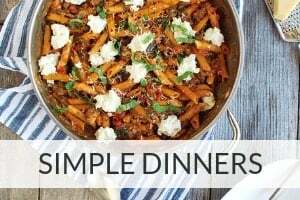 I love how easy and quick this recipe to prepare. Perfect for our busy schedule next week. Definitely adding this to our list of our weekly menu plan. Thanks for this recipe. this looks incredibly delicious! I love salmon – makes for a great dinner and it’s easy to prepare! This looks so delicious! I could eat salmon every day if I had to. It’s my favorite fish to eat. I happened to have some wild salmon. I was going to do a teriyaki salmon but now that I read your post I think I’m going to go with a Parmesan one. Thanks for the inspiration! Great!…although teriyaki + salmon is definitely a winning combo too. Thanks for the comment, April.